Framed for cattle rustling and horse theft by the corrupt banker who foreclosed on their employer’s ranch, Buck and Dobie find themselves out of work, out of cash, and out of luck. So, they decided to try and live up to their reputation as wanted men—an idea easier said than done.Buck Hawkins and Dobie Garrett are a pair of cowboys in the Texas Panhandle. They’re unlikely outlaws—until their ranch is stolen and the two cowhands framed for rustling and horse theft by a crooked banker.Now with a price on their heads and hunted by the law, the two cowboys decide that if they have to ride the outlaw trail, they might as well be the best holdup artists in Texas. Problem is, they aren’t all that good at the trade. 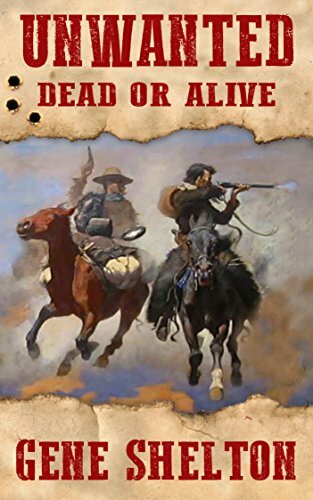 Just when they thought it couldn’t get worse … During a botched stage holdup, they meet Marylou Kowalski, who demands at the point of a derringer that Buck and Dobie kidnap her; she’s bored with her life and looking for excitement on the outlaw trail. Marylou convinces the two fugitives that the three of them can score the ultimate in revenge—holding up the crooked banker who posted reward flyers on the two cowboys.A novel by Gene Shelton, author of Houston Madam and other books.